A friend of the project shared this recipe at a salad class given to shoppers at The Table at St. George's, a local fresh market food pantry. The Doctor Yum Project also participated and introduced shoppers to our Dinosaur Kale Salad recipe and our Pineapple Power Salad. 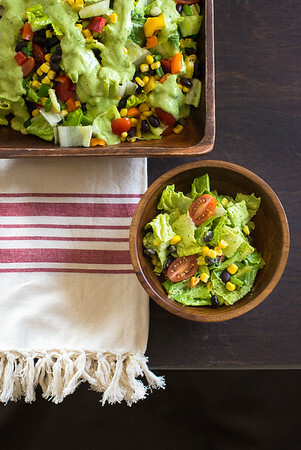 Everyone loved the easy preparation of this Southwest Salad, but the delicious dressing was the star of the show! This salad could easily be converted to a main dish by adding grilled shrimp, salmon, or chicken. Chop lettuce, bell pepper, tomatoes, and green onions. Toss together in a large bowl with black beans and corn. To make dressing, puree cilantro, avocado, lime juice, garlic, olive oil, vinegar, salt, pepper, and honey all together in a blender or food processor. Taste and adjust seasonings. Add cilantro lime dressing to salad and toss to coat evenly.